Welcome to the new school year! Our first meeting, The Salad Luncheon, was a big success. A big thank-you to our members for the hard work towards making this year start out as one of our best. Time to make reservations for the December 1, 2018 Christmas Luncheon. dkg_2018_chistmas lunch_reservations.pdf: Deadline is November 16th. Cost is $30.00 and that includes entree, desert, tea and coffee. Make your checks payable to Lambda Alpha-DKG. And please bring a wrapped gift for an Elementary student (mark with grade level or age and gender). MEMBER UPDATE: At the Salad Luncheon, we had two excellent member candidates join us; Cindy Davis sponsored by Leigh LaVergne and Anne Pimmel sponsored by Brenda Lozano. The 2018 Grant-in-Aid honors the memory of Brenda Lozano's mother, Alice Ambrose. Through Brenda's culinary talents and generosity, another woman will have some financial support meeting her college expenses. The application will be posted on Spring Branch's Naviance website. Please share this opportunity with any graduating senior woman you think worthy. The deadline is March 15, 2019.
development and personal enrichment 100% online, accessible from any Internet connection. April 10, 2018 meeting of the Lambda Alpha Chapter of Delta Kappa Gamma was held at the Trini Mendenhall Community Center on Wirt Road. 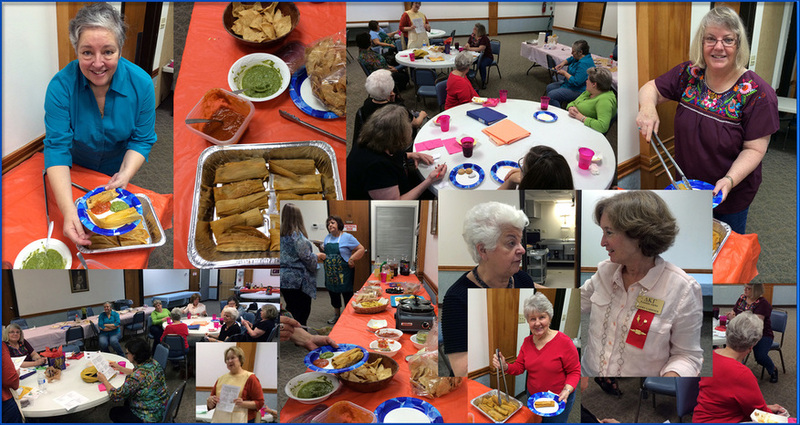 Social hour included dog-themed foods such as hot dogs, hot dawgs (a slimmed-down version of a pig in a blanket), paw-tato chips, and puppy chow provided by Rosemary, Tobey and Sue Thompson. Several canines from the Faithful Paws Therapy Dog group and their owners were there as well. Dec. 2 - 11:00 a.m. 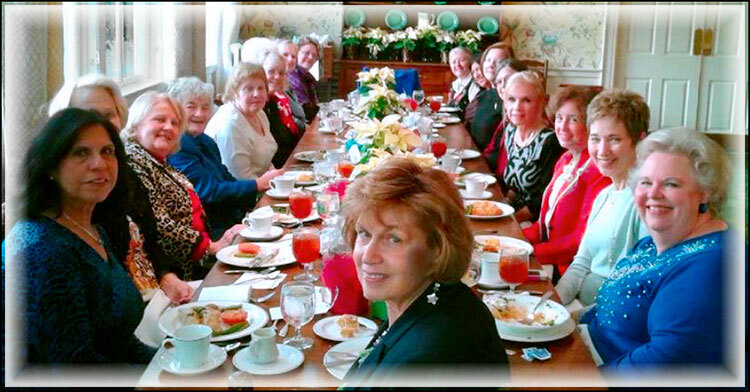 Annual Christmas Luncheon at the Junior League. parents may be recovering financially from Harvey damage. Jan 6, 2018 - (Saturday) 10:00 a.m. brunch at Tobey's home. Our program will feature guest speakers from Literacy Advance. Buffalo Creek Library Emergency and Fall Festival Spook Hous. Please Contact Toby if you can help. The October meeting at the Mendenhall Community Center was a big success. A docent from the Houston Art Museum gave a very interesting presentation. 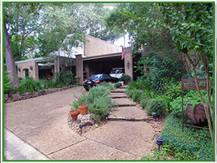 Karen Harrell's Home. More information will be sent out later next month. Lambda Alpha Chapter is proud to receive the 2017 Annie Award for Outstanding Program. 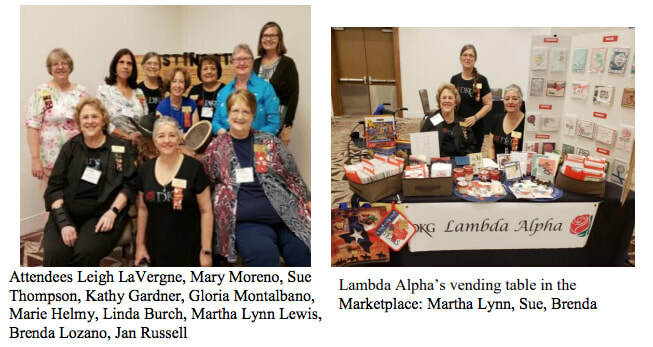 "Hope for Youth"
2016-dkg-meeting-dates.pdf We have a great 2016-17 executive board that has met to plan a year full of Lambda Alpha experiences and I am excited about the active participation in these upcoming activities. We need the skills and time of all members to move Lambda Alpha forward. I am excited about what we can accomplish together. 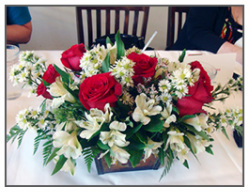 Enjoy our newsletter, thanks to Jane Riddle and I hope you noticed that we have a new name - Lambda Alpha Rose Petals. 2. March 28th – Monday 5:00 for refreshments and socialization with meeting at 5:30 MMS Note this is a day earlier than originally set. Cognitive Diversity- We will apply to get CPE credit for this meeting. 4. June 23rd-25th – 87th Texas State Convention in Frisco, Texas – We should get a big group to carpool and share rooms. 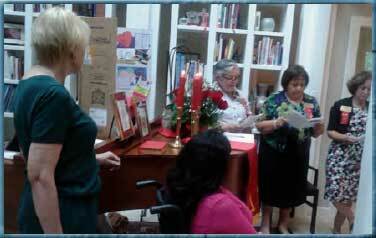 I send heartfelt thanks to Brenda Lozano who organized and presided at the Interntional Dinner. The food was delicious. Also a huge thank you to Melissa Salyer who organized our event at Parkway Place. Everyone who attended had a great time catching up while honoring Jane Burke. (see photo above) Don't forget out March meeting. It is Monday the 28th. ​Brenda filled me in on this month’s meeting. Seventeen members gathered to make cards. 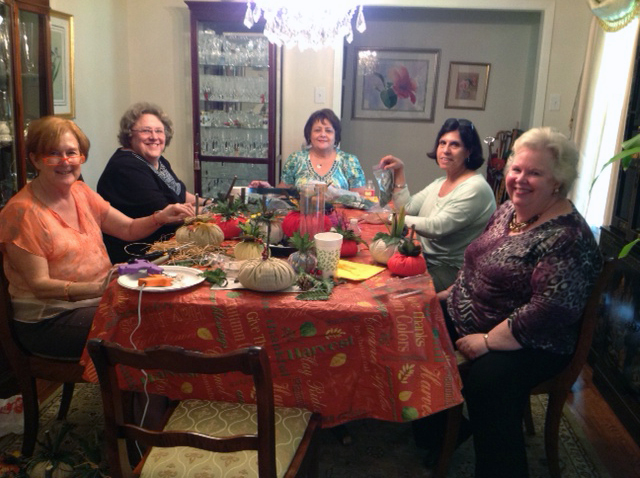 It sounds like members had a great time making personalized as Mary Moreno called them “fancy” cards. Please mark Saturday, February 20 on your calendar 2:00. Melissa Salyer and I have planned a DKG event at Parkway Place Retirement Center where Melissa’s mother Jane Burke, one of our chapter’s charter members, lives. We will share our love of teaching with Parkway Place residents who are retired educators. 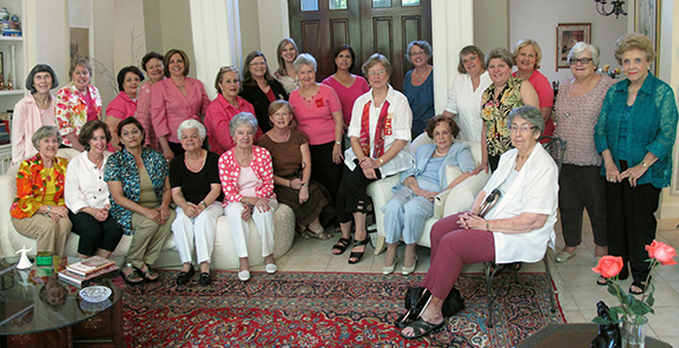 Some Parkway Place residents were at one time members of a DKG chapter. This is a great outreach opportunity for our chapter to honor Jane and to reach out to fellow teachers and former DKG members. For fun ideas, fundraisers and convention highlights read our excellent January Newsletter. Do not forget to send in your suggestions for our newsletter name. The Unifying Project for the TSO State convention this year is the Boys and Girls Clubs of San Antonio. The clubs provide school supplies to children for the new school year, and it is our delight to take items for distribution to boys and girls across the San Antonio area. The following is a list of suggested supplies. School Supplies for the Unifying Project: Boxes of Tissues, Glue bottles Crayons Wide ruled notebook paper Wide ruled notebooks Rulers Colored pencils Ballpoint pens (blue/black/red) Backpacks Mechanical pencils Glue sticks Pencil sharpeners Highlighters Three-‐ring binders Composition notebooks Graph paper College ruled notebook paper College ruled notebooks Erasers Markers #2 pencils Pocket folders w/brads Gift cards such as Target, Walmart, Office Supply/Max, grocery stores, Dollar Store. If you want to donate, please contact us and we will be glad to transport for you. Karen Harrell's Home. More information will be sent out later this month. See News . Start collecting sale items & making plans. Lambda Alpha Chapter creating these very popular pumpkins for our fall scholarship fund making activities. HAPPY NEW YEAR _ Time to start planning for the state Convention and 2014 Chapter events. Note that the Lambda Alpha Yearbook is now complete. Lambda Alpha Chapter of DKG took over 150 stuffed toys to Fire Station 77. As Sue Thompson says; "not bad for a chapter our size!" Thanks Sue, Leigh, for spreading good cheer. "We're expanding the vision" GHACC Luncheon Left to right_ Chris, Marie, Leigh, Kathy. Below photo shows President Leigh with the Pumpkin Delivery Trunk and Marie Helmy with her 25 year DKG Certificate of Appreciation. 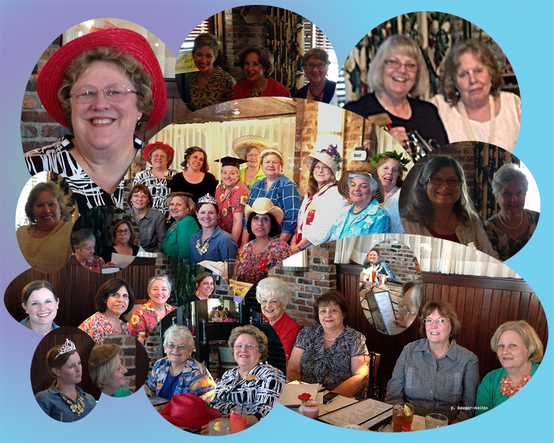 2013 Garage Sale workers: Sonia Greiner, Clara Reimers, Martha Lynn Lewis, Ina Schmidt, Mary Moreno, Brenda Lozano, Cathey Jones, Karen Harrell, Rosemary Nelson, Chris Morrison, Sue Thompson, and President Leigh LaVergne. Garage Sale is on Saturday September 28th at St. Christopher's Episcopal Church (1656 Blalock) Start putting aside all those extra things around the house. I love attending our DKG conferences! This year was no exception. It was held at the beautiful Renaissance Hotel in north Austin. One of the nice things about being wherever they are held is that the people stay the same...always friendly, helpful, anxious to learn, and fun to be with. I attended several sessions that were just filled with ideas to share with you all. Some were about increasing our membership, as every chapter is faced with the same challenges, but other sessions were involved with personal growth and lifelong learning. I can't wait to tell you all about ways to go on world-wide trips and to receive reimbursement for up to $500 in expenses! Be sure to attend our Salad Luncheon in the fall for more details! Participants this year were Marie Helmy, Kathy Gardner, Chris Morrison, Clara Reimers, and yours truly, Leigh LaVergne. Holiday Luncheon at the Junior League. We enjoyed excellent food, great fellowship and an informative speaker. Message from our President: 2013 brings new excitement and challenges for our members. Join us at the meetings and events. You are Delta Kappa Gamma, proud educators! Read about Karen Rodriquez and the educational administration program at Texas A&M University where she was selected as recipient of the Paul R. Hensarling Distinguished Student Award Winner in Educational Administration. Photos on the left are from the Anniversary meeting. "nicely done, ladies"
Lambda Alpha Chapter Salad Luncheon First meeting of the 2012-13 year. 2012 Lambda Alpha Luncheon was enjoyed by all. A great meeting, food and fellowship! Thank you Karen for providing your beautiful home and for the officers that put together the beautiful presentation and music. 2011-12 Salad Luncheon. A great turn out in a lovely home with great food and fellowship. Lambda Alpha Holiday Luncheon Our members did not waste another opportunity to display their generosity as we collected children’s Christmas gifts for less fortunate students at Buffalo Creek Elementary School. Convention photos can be seen on the Texas State web site above. Norma Muniz shared her expertise and gave members a mini-lesson in jewelry masking at the Tri-Chapter annual meeting. Congratulation to Wanda Baker. Her article was published in the Winter Edition of The Delta Kappa Gamma Bulletin. Look on page 50 at http://www.dkg.org under publications. 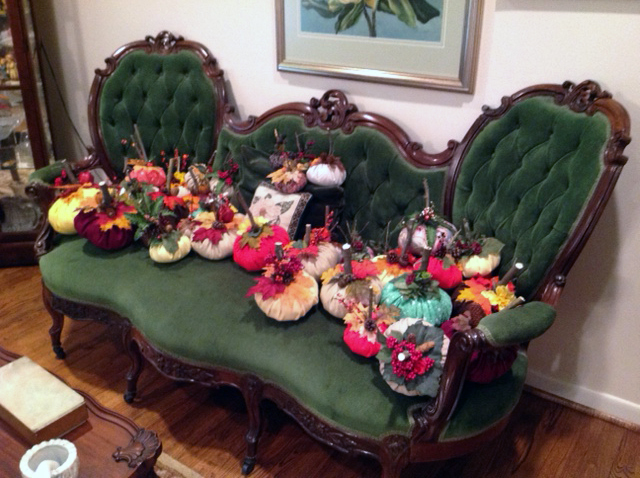 was held : 11:00 am at the Junior League of Houston Tea Room. Gifts were brought for elementary students and mark with the suggested grade level. Celebrating Erin Johnson soon to be, blessed event at the home of Aban Rustomji. Erin is the tallest standing next to Wanda Baker.